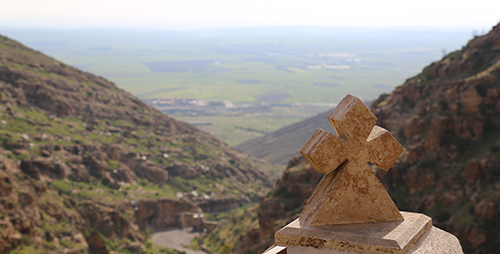 Iraqi Christians – SOLI has worked with the Iraqi Assyrian Christian community since 2014, training, advising, and supplying both the Nineveh Plain Protection Units (NPU) and the Nineveh Plain Forces (NPF). SOLI also provided more than half the funding for the construction of the first Iraqi Assyrian Christian military base. Our bomb dog team, The Paws of Liberty, were deployed in Iraqi Christian areas to search homes and businesses for bombs planted by ISIS and unexploded ordnance, and to assist in searching vehicles at checkpoints. SOLI continues to supply body armor to both the NPU and the NPF and stands ready to provide additional support as needed. Burma – SOLI is currently in discussions with numerous forces in Burma to provide training, advising, and supplies to assist them in protecting their communities from the oppressive and brutal Burmese regime. SOLI personnel were deployed to Asia to begin training a Karin force in summer 2018, but this program has been put on hold as the force has entered peace negotiations with the Burmese regime. We plan to deploy an additional team in early 2019 to begin work in Burma with the same force or another that meets our criteria for support. The Philippines – SOLI deployed a team to the Philippines in Fall 2018 to meet with community leaders and inspect potential training sites for the training of a community defense force to protect against attacks by ISIS and other threats. Discussions with the leadership continues and no other information can be released at this time due to security concerns, but will be in the future. Africa – SOLI met with representatives of a Christian community in Africa during their visit to Washington, DC for meetings with the US Congress in 2018. We anticipate deploying a team to their country in 2019 for further discussions, as well as deploying an additional team to a second African country where Christian communities are facing intense persecution, kidnap, and murder. No other information can be released at this time due to security concerns, but will be in the future. In 2017 SOLI began working with a new set of trainees, a litter of 5 rescue dogs we adopted in Iraq to train as the Paws of Liberty bomb dog team. They are each named after the original Sons of Liberty of the American Revolution (Samuel Adams, Paul Revere, John Hancock, Patrick Henry, Benjamin Rush), but they are far cuter and were on a mission to save innocent men, women, children, and other dogs from being killed by bombs planted by ISIS. The statistics are shocking: from 2011-2014 over 53,000 civilians were killed or wounded by IEDs (Improvised Explosive Devices). In Iraq alone, over 14,000 people have been killed or wounded by landmines since 1991. The Paws of Liberty were on a mission to protect both civilians and military personnel from falling victim to such attacks. After completing their training, the Paws of Liberty were deployed to areas where ISIS had planted explosives or where unexploded ordnance from the war posed a risk to people returning to their homes and businesses. These missions helped make the largest Iraqi Christian city, Qaraqosh, safe for civilians to return home after years of living in refugee camps because of ISIS. 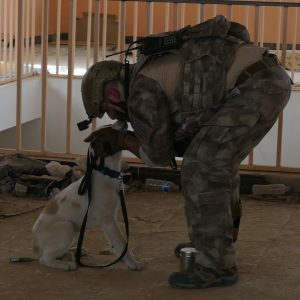 The Paws of Liberty were also deployed to checkpoints where they assisted with searching vehicles entering Iraqi Christian areas to defend against acts of terrorism and ISIS sleeper cells, and searched the vehicles of visitors to a prison near Qaraqosh where ISIS prisoners were being held. Having served bravely and honorably during a critical time in the fight against ISIS, the Paws of Liberty retired after the war and remain together as a family enjoying life on a farm in Iraq. We anticipate training future Paws of Liberty bomb dogs in other countries when this capability is required for our missions. Our work with the NPU and NPF was the subject of The History Channel’s History Now web series about SOLI. This series (7 episodes) can be viewed here. Sons of Liberty International worked with the Mosul Galant Force (MGF), a Sunni force in Eastern Mosul tasked with securing liberated areas and searching for ISIS sleeper cells in 2017. We provided advising and supplying services for the MGF, in addition to transportation and security for international press and others in Mosul. Sons of Liberty International plans to expand operations to other countries once there is sufficient funding to do so. 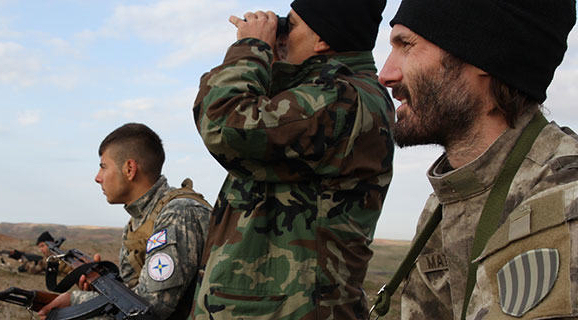 Our current and future missions are focused on assisting local forces in the fight against ISIS, and helping to end Christian persecution around the world by helping Christian communities learn to defend themselves against terrorists and insurgents.